Sturdy is one of those abilities that are good, but can be played around. In the video games, Poison, Burn, Leech Seed, etc. will finish off the last HP or keeps that Pokémon from being at full HP. The same can be said for the TCG, since Poison and Burn does work between turns and makes the affected Pokémon damaged or being KOed due to its last remaining HP being wiped. If a hypothetical attack places 20 damage counters, then 13 of those will KO that Donphan regardless. Some Pokémon in the TCG can deal massive damage, more than enough to KO anything, which Donphan can come in and survive via Ability, but even players can try to hit soft and then hit hard later, just to play around the ability. If, for some reason, your opponent didn’t play around this ability, then Donphan can take any hit that’s 120 or more damage. Because of its 130 HP, being down to 10 HP left means that Last Chance Potion heals 120 damage, exactly what you need to bring it to full health. And if you eventually run out of uses of Last Chance Potion, then a last minute Hustle Band ramps up damage output for those with 30 HP or less and is damaged before finally going down. With those cards, Donphan gets to stay for at least five turns doing Rolling Spin, which costs FCC for 70 damage, plus 70 more next turn, making it 140 damage if Donphan isn’t interrupted such as being switched or leaving play. The damage is ok, being able to 2HKO the game, but having to constantly use it uninterrupted makes it unreliable. In the end, it’s hard to justify using Donphan. I liked the concept of this card, but those moving pieces will almost always be interrupted or played around at some point during your matches. I don’t think it even does well in Limited because Mixed Herbs won’t bring from 10 HP to full and you need three full attachments to attack. 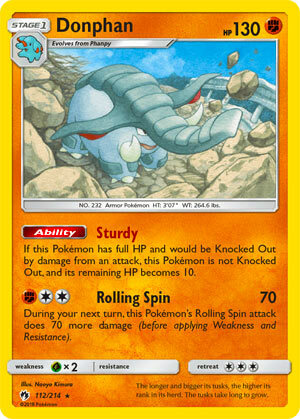 Donphan (LOT 112) stomps its way into the Pokemon TCG from the Lost Thunder expansion set. Donphan has one attack, Rolling Spin, which – for one Fighting and two Colorless energy – does seventy damage; however, on your next turn this same attack from this same Pokemon does 140 damage. This synergizes well with its ability Sturdy. If Donphan has full HP – and this is key to remember: if it even has a single damage counter on it, Sturdy does not work – AND if Donphan would have been KO’d from an attack (not hard to imagine as it only has 130 HP and has Grass weakness), it is not KO’d but instead has only 10 HP remaining. This means you attack in the first turn for seventy, almost get KO’d on your opponent’s next turn, and then when it comes back to you, you are hitting your opponent for 140, totalling up to 210 damage if you’re hitting the same Pokemon you hit previously. The bad news, as we all remember from Ariados AOR and Raticate Break, if you are reduced to ten HP and are affected by Burn or Poison, sorry for your luck but you’re KO’d in the transition phase into your turn. The good news is that this reduction to ten HP makes Last Chance Potion and Hustle Belt. Rolling Spin, on its second turn, actually does 220 damage if you have Diancie Prism in play and a Hustle Belt attached. This should raise your eyebrows as it is becoming more and more important to hit two hundred something with a single attack. The ability to potentially one shot Tag Team GX’s is going to becoming a very significant factor starting on Friday, especially if you can do this from a single prize Pokemon (why do you think I’ve been spending so much time on Blissey and Chandelure lately?). All said, however, Donphan just isn’t that good. I tried it in three matches and didn’t win a single game. It’s at least a two attachment attack (and you can’t use Wishful Baton and Hustle Belt) if you have a DCE, and we don’t have a good Fighting energy accelerator like Malamar FLI or Quagsire DRM / Naganadel LOT. And if your opponent sprays you with a Flying Flip or Spell Tag or Feather Arrow, well, sorry Donphan, it’s back to the binder for you. We begin this week with Donphan (SM – Lost Thunder 112/214). Perhaps I should say “began” this week, as this is going up a few days late. Donphan is a Stage 1 [F] Type Pokémon with 130 HP, [G] Weakness, no Resistance, Retreat Cost [CCC], the Ability “Sturdy”, and the attack “Rolling Spin”. Sturdy activates if your HP is full right before an attack would KO Donphan from its damage; instead of being KO’d Donphan survives with 10 HP. Sturdy’s wording means Donphan can be Active or on your Bench, and the damage can come from any attacks, even ones made by your own Pokémon (not that I can think of anything which does 130+ to your own Bench). Rolling Spin requires [FCC] and does 70 damage while placing an effect on Donphan (or whatever is using the attack, in the case of attack copying); on your next turn, Rolling Spin does 140 damage. As with all attack effects that reside on a Pokémon, the effects of Rolling Spin go away if Pokémon which used it evolves, devolves, goes to the Bench, or goes to another zone (like being bounced to your hand). Sturdy is – pardon the pun – a solid Ability; not great, not overly good, but above average. There are many ways to bypass the protection offered by Sturdy, some simple like just using Guzma to get at something else, or hitting Donphan again if your opponent isn’t bothering to heal. Many decks will have less general tricks as well, like hitting Donphan hard enough to trip Sturdy while Donphan is Burned or Poisoned, or using an effect which shuts down Abilities. Being a Stage 1 isn’t a problem, it just isn’t as good as being a Basic; a little more deck space, a little time to Evolve, and Donphan still hits the field without much of a hassle. The [F] Typing is valuable, while anti-[F] effects are out there, and [F] Resistance is one of the more commonly encountered Types, neither is that big of a deal… but [F] Type support often is a big deal, or at least a good one, as is the fairly abundant amount of [F] Weakness in the TCG. The HP is less important than normal, owing to the Ability; indeed, one might argue that being smaller would be better because Sturdy would just be that much easier to trigger but it enables certain combos while also being a decent (though not great) when your opponent does get around Sturdy. [G] Weakness is dangerous but less so when Sturdy is working. A lack of Resistance is disappointing but also typical. The Retreat Cost means Donphan is likely stuck in the Active position without some help, but it also means Donphan can use stuff like Heavy Ball in Expanded. Rolling Spin would be bad without Sturdy because you really need to hit with it twice in a row and without the effect being reset, such as by being KO’d. Even then, it is important to remember you attacked twice for three Energy, and only averaged a decent 105 damage. Donphan’s performance can be augmented in the usual ways, but I’m not sure if that is wise. Too many Donphan on the field at once, and spread attacks can force you to burn through any healing you’re running, assuming you’re running any. As Donphan isn’t fast to power up, spamming Acerola doesn’t seem like a good idea. Last Chance Potion should work if Donphan only survived due to Sturdy. Or maybe you leave the damage on Donphan and slap a Hustle Belt onto it; Rolling Spin can hit for 130 or 200 that way. Counter Energy with a Counter Gain does allow a Donphan to go from “zero” to “attacking” in one turn, but besides needing to be down at least one Prize. When our strategy is about denying an opponent Prizes and you’re doing that trick to just swing for 70 damage or Donphan is likely already damage from being up front and having used Rolling Spin the previous turn… not impressive. So much you can combine Donphan with, but most of it works better elsewhere. Even more so in Expanded; more combos, but more competition and counters, providing a net negative. Limited is where to enjoy Donphan; everything about this card just performs better there. Donphan’s biggest problem is that it needs three Energy to attack, and then to attack twice to really bring the damage. Fix one or the other, and we probably have a competitive deck.